Fortified by three major 20th-century acquisitions made last fall—including two revealed exclusively to The Art Newspaper—the Crystal Bridges Museum of American Art is making sweeping changes in its post-war permanent collection galleries. Donald Judd's Untitled, 1989 (Bernstein 89 24), a ten-stack piece made of copper and red Plexiglas, and Andy Warhol's Hammer and Sickle,1977, an acrylic and screen print on canvas, are joining Mark Rothko's No. 210/No. 211 (Orange), 1960, which was unveiled in a special exhibition at the museum in October. Crystal Bridges bought the Judd at Christie's evening sale in New York on 14 November last year for nearly $10.2m; the previous night, it paid more than $3.4m for the Warhol at Sotheby's. The museum had previously announced its purchase of the Rothko from a private Swiss collector for an undisclosed sum, estimated by experts at around $25m. Reviewers have criticised the post-war galleries as the weakest part of the collection ever since the museum, lavishly financed by Wal-Mart heiress Alice Walton, opened in November 2011. "It's fair to say that we are very actively seeking to shore up the 20th century, including early Modernism," the museum's president, Don Bacigalupi says, "though not to the exclusion of other things." He says that the new pieces "give us an opportunity to create the moments in the post-war period when Surrealism transitions to Abstract Expressionism, then to mature Abstract Expressionism, and from neo-Dada to Pop art. We didn't have the anchors to do that before." Bacigalupi has yet to pinpoint the precise locations for the new works, saying "a lot of good iterative conversations about the installation are still going on". The Rothko, recently shown in the special exhibition galleries during "See the Light: the Luminist Tradition in American Art", which closed in January, will be the centrepiece of the first post-war gallery, probably replacing a Joan Mitchell painting that has hung, alone, on an interior wall. 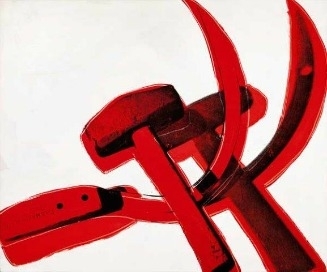 Warhol's Hammer and Sickle will go in the next gallery of art from the 1970s and 1980s (joining a Warhol silkscreen portrait of Dolly Parton), and the Judd, which at more than 30 ft tall nearly grazes the ceiling, will likely go in between those two sections. The museum is also integrating other newly acquired works into this reinstallation, including Miriam Schapiro's collage, A Mayan Garden, 1984, in the contemporary section. To make room for the new pieces, the museum's early works by Rothko, Pollock and others are moving to a side gallery once occupied by portraits. It will be "a concentrated installation that will give our guests insight into the birth of Abstract Expressionism," says Kevin Murphy, the museum's curator of American Art. "We can trace artists' interests in Cubism, biomorphic abstraction, Surrealism, and psychoanalysis so that, by the time visitors stand in front of our glorious 1960 Rothko, they will have seen where he and his peers came from." Bacugalupi and Murphy are also reconfiguring the early 20th-century galleries, adding Theodore Roszak's 42nd Street (Times Square), 1936; Agnes Pelton's Sand Storm, 1932, and Marvin Dorwart Cone's Stone City Landscape, 1936. Another new purchase, Max Weber's Burlesque #1, 1909, has already been hung. "They will have a dramatic impact on those galleries," Bacigalupi says, though he adds that "there's still work to be done there". The museum draws down about $15m a year from its acquisitions endowment, and Bacigalupi says the museum is paying the rest of the tab for its purchases the same way other museums do—by fundraising. Since its opening, nearly 734,000 people have visited Crystal Bridges.